This post continues on from Part 3, documenting my roadtrip from Flagstaff, AZ to San Francisco, CA. Our journey to San Francisco took three days. We wanted to take the Pacific Coast Highway as it was supposed to be very beautiful and much more interesting than the straight highway in-land. As San Francisco is so far away from Los Angeles, we decided to stay in two hotels along the way. The first was the Candlewood Suites in Santa Maria. It was a very nice hotel with a big, clean room and a kitchen with pans, plates and cutlery. There was also a small shop at the hotel with cheap snacks. The second place was Inn By The Bay in Monterey. This was a small motel, and the room was also very small. Good for one night but not the best place. It was however close to the bars and we had one of our only nights out in Monterey. Staying over for two nights allowed the driving to be only about 3 hours a day. I wasn’t too impressed with the Pacific Coast Highway to be honest, I felt it wasn’t as pretty as people had said it was and the scenery stayed much the same all along the coast. We did see some elephant seals at one spot which was nice. I prefered the road from Flagstaff to Las Vegas as that was surprisingly interesting. I think I was a bit bored of driving for so long at this point. Our hotel in San Francisco was the DoubleTree by Hilton, north of the airport. It was very good, and similarly equipped to the Vegas hotel. Clean and comfortable and you get free cookies which were very nice. The only issue was having to get into the city every day. Initially we tried driving, but it was very difficult to find parking. We learnt our lesson and took the train in every other time. Public transport was very cheap. One of the first things we did in San Francisco was visit the Golden Gate Bridge. It was quite cloudy at the time, but we got some good views. We crossed the bridge in our car and parked on the other side to walk around. What we noticed was San Francisco is much colder than all the previous places we went to. I had to wear my hoodie almost all the time, and it got quite windy near the bridge. The next day we took a look around Fisherman’s Wharf. It’s a very touristy area with lots of people and shops. There’s a really good arcade with antique arcade machines you can play on Pier 45. It’s free to get in, you just pay for the games. We also visited the USS Pampanito, an old World War II submarine, which was interesting. And two more great sunsets were seen. 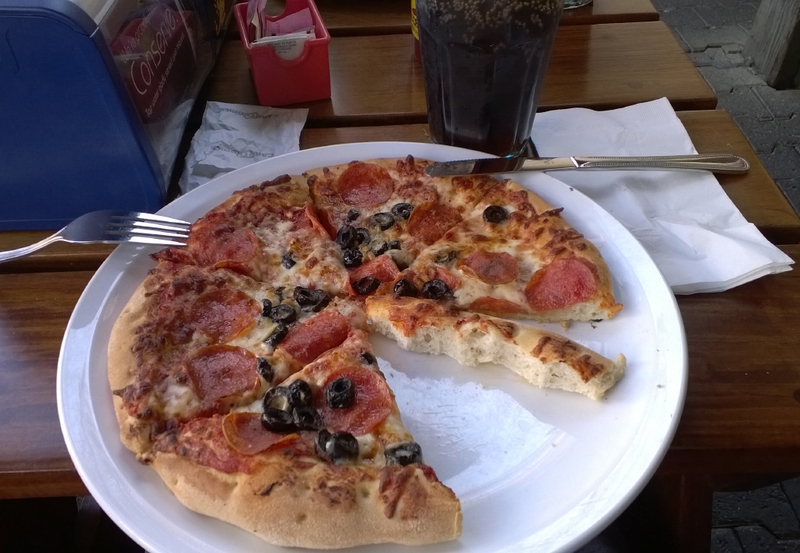 While at Fisherman’s Wharf, I had one of the best pizzas ever. It was at Wipeout Bar & Grill on Pier 39. Pepperoni, garlic and olives. Everything was cooked just right and it was delicious. Of course, we needed to have a ride on the cable car. I was initially skeptical as we had to wait in a queue for over an hour to catch a ride from the bottom to the top, but it ended up being really fun. I got to try sitting and standing on the edge of the car and it was a really cool mode of transport. People got to ring the bell too. Another classic to visit in San Francisco is Alcatraz Island. We booked our tickets back in June, as they get fully booked quickly and we wouldn’t have been able to go if we got them at the time. It was an interesting experience to see the prison and find out about the stories of real people there. The audio guide was great, with surprisingly high sound quality. Taking the boat allowed us to get some nice views of the city too. We took the last tour, so it got quite dark near the end. Apparently it’s quite scary at night, but I didn’t get creeped out at all while there. There was always lots of people around and it felt more like a museum than a working prison. If you were alone however, it would probably be very scary. I recommend the last tour because the prison area clears out and you can get photos of the empty halls and cells more easily without people coming in from newer tours. On our last day before going back to England, we decided to visit Silicon Valley. A lot of tech businesses are based in/near the San Francisco area, including Google, Apple and Facebook. We went to have a look these headquarters to see what they were like, being interesting in technology companies and their products that we use everyday. Google had the nicest, with a big open campus with people walking about. They also had an outdoor celebration as that day was 6 years since the launch of Chrome. We just walked by though as it was employees only. Apple was alright, it was a nice looking area and we walked the whole way around Infinite Loop. And finally Facebook. The building looked like a hospital and it was very boring to be honest. It might have been lovely inside, however it looked really dull from the outside. Strange considering it’s supposedly a hip, young company with loads of money to spend on their 3 year old HQ. So we’re at the end of our journey. 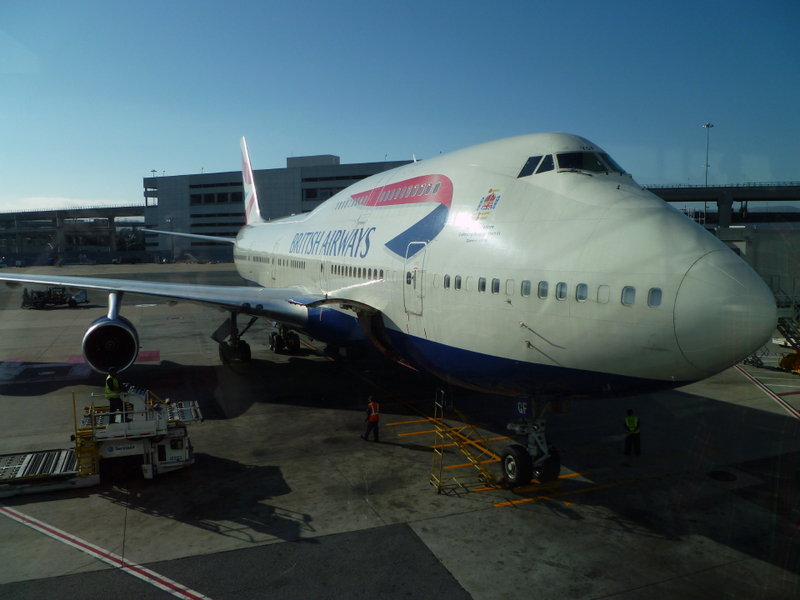 The next day we took our flight from San Francisco airport to London Heathrow. I’ve had an amazing time. We got to do loads of really fun stuff. Missed out on a few things like being in a Hollywood TV audience. We probably should have stayed a bit longer in Vegas and had a night out too. Looking back now it feels very surreal, like it didn’t happen to me. I’ll definitely like to return to America, either on holiday or for work. 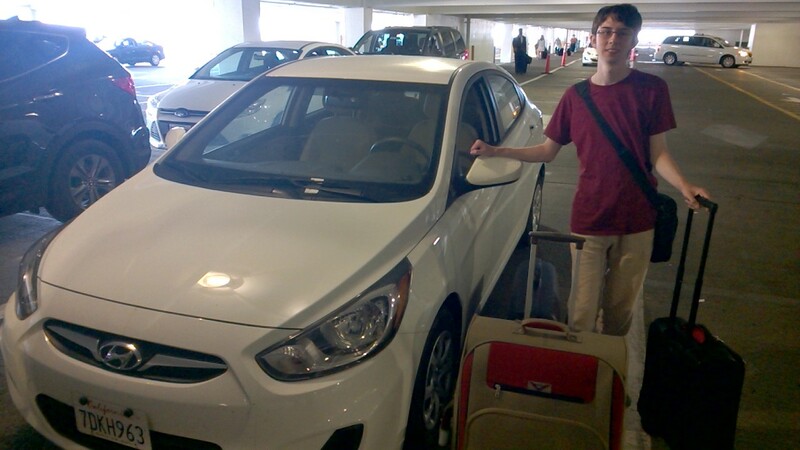 The above photo is us handing the car in at the airport. 2,296 miles total in this car. Thanks again to Mitch and Ilyssa for letting us stay with them. Also thanks to Danny Brown for a great time and driving us everywhere. With no crashes! P.S. Some info on how the photos were captured: most photos were taken on a Panasonic Lumix DMC-FH20. A few were taken on either a Nokia Lumia 820 or a Lumia 925. The photos have all been resized from the originals for this blog. Some touchups have been done in Photoshop but basically what you see is what we saw. Apart from night photos - they always seem to be rubbish.